Looking for a fun and social activity for your team building event or social gathering? More than just attending a cooking lesson, our packages are designed to be fun, interactive, and enriching. We hope to share our insatiable love for food so you and your team will walk away with a truly memorable experience like no other! An interactive hands-on class where participants will team up to make their very own pizza creation! There will be a short demonstration by Our Chef Instructor Gary, on making pizza dough/base from scratch. Teams have to showcase their creative juices and exercise teamwork using the various ingredients and premade dough provided in advance. One team will win the challenge of ‘Best Pizza’ and at the end of the class, they will all sit down for a meal together. In this interactive hands-on class, participants will get to make their very own pasta from scratch, and also cook their very own Pomodoro style pasta. Team challenges can be requested and at the end of the class, everyone will sit down for an enjoyable meal and enjoy their handmade creations. For those who prefer a more relaxing class, join us for an exploratory journey learning how to pair wines with cheeses from our very own cheese room. Participants will learn about the various types of cheese – blue, hard, soft, cream in this introductory level class. Looking at making a simple and hassle-free dessert? Fret not! With tantalising options such as tiramisu and red velvet cupcakes, you can participate in a short yet interactive dessert making class at your fingertips. Enquire for the full dessert menu! Bring your taste buds on an Asian culinary tour in this fun cooking class where participants will get to create a 3-course Asian meal - entree, main and a dessert. Dishes include local Singaporean delights such as laksa and satay, as well as Vietnamese and Thai classics such as Vietnamese Spring rolls, and Kluay Buad Chee. Participants will be able to enjoy their culinary creations after the class. Enquire for the full class menu! Say Bon Appetit in this French and European themed class where participants will get to do hands-on cooking and try their hand at creating dishes such as Gratin Dauphinoise, Paella, Panna Cotta ...and more! The class will feature a 3-course meal, consisting of entree, main, and dessert, and all students will get to sit down and enjoy their delicious cooking after the class. Enquire for the full menu! Satisfy your sweet tooth in this hands-on class that features 2 scrumptious desserts of your choice. 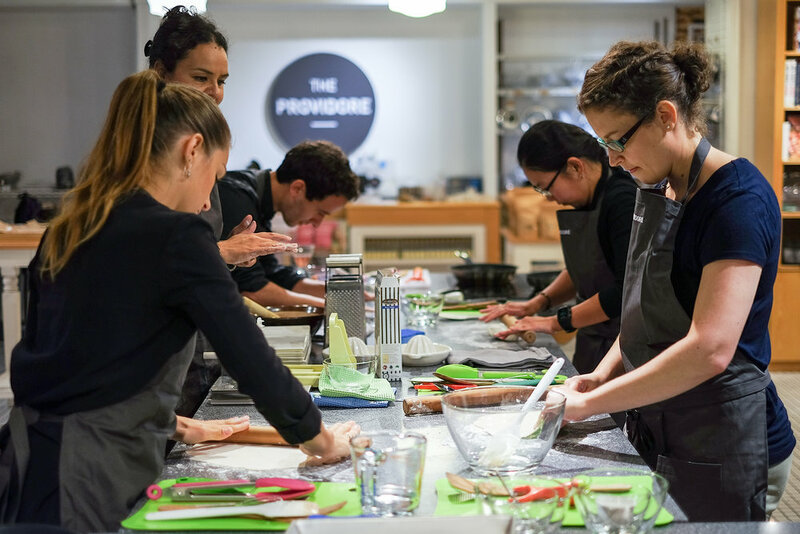 With tantalising options such as tiramisu and red velvet cupcakes, this promises to be a fun and engaging class, and participants can order mains from The Providore cafe to complete their meal. Enquire for the full dessert menu! This exciting class starts before you begin cooking! This class requires your team to improvise and work together to incorporate your mystery ingredient into either your main course or desserts within a set time frame to set their dishes apart from the rest! Teams will have to display their creativity, culinary skills and more importantly teamwork to complete their challenge. Cook festive treats with our in-house chef! With a festive menu to celebrate the holiday, prepare a large communal shared main course with chef using the best ingredients sourced with us; at The Providore! Sit down and enjoy your festive meal after the class! Enquire for the full menu and further details! Thank you! We have received your message and will be getting in touch with you shortly. If you would like a more substantial meal, order from our gourmet menu below (exclusive discount of 10% off the displayed prices).